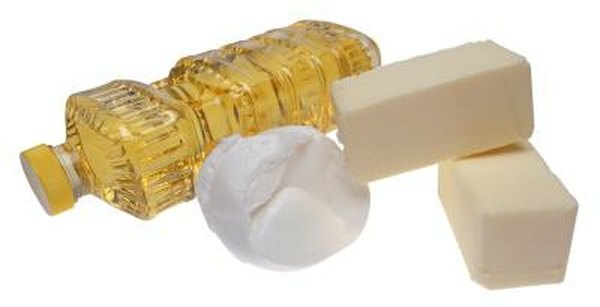 Coconut oil and lard are two types of dietary fat, packed with calories at more than 100 calories per tablespoon. They're derived from different -- coconut oil comes from a plant source, while lard come from animals -- and differ significantly in their flavor, but they're both loaded with saturated fat. While both fats should be consumed in moderation, coconut oil may be the lesser of two evils. Dietary fats serve as rich sources of energy, which means they fuel your day to ay functions, but saturated fats come with a hefty price. Consuming too much saturated fat is linked to high blood cholesterol and associated health problems, such as heart disease and stroke. You should limit your saturated fat intake to less than 7 percent of your daily calories. In a 2,000-calorie diet, this translates to roughly 16 grams daily. Lard, as well as household shortening and vegetable oil, has 117 calories per tablespoon and 13 grams total fat. These dietary fats have slightly more than 5 grams saturated fat, and the rest is made up of polyunsaturated and monounsaturated fat. A tablespoon of lard contains 7 milligrams of cholesterol -- about 2 percent of your daily limit, according to the American Heart Association. One tablespoon of coconut oil contains 121 calories and 14 grams of total fat. Of the oil's total fat, more than 12 grams come from saturated fat; the remainder is comprised of polyunsaturated and monounsaturated fat. Coconut oil has no cholesterol. Coconut oil does have on advantage over lard -- it increases the levels of beneficial cholesterol in your bloodstream, according to Harvard Health Publications. However, you should still use it in moderation due to its saturated fat content. Choose unsaturated fats over sources of saturated fat to benefit for health. Plant oils -- such as canola oil, safflower oil, peanut oil, olive oil, sunflower oil, soybean oil and flaxseed oil -- contain unsaturated fatty acids, which lower your harmful cholesterol levels and help reduce your risk of cardiovascular disease. Olive oil's rich flavor makes it good for sauteing, while canola oil's mild flavor works well in baked goods. Some oils -- such as flaxseed oil -- are best served at room temperature, such as in salad dressings.